I’ve often heard that savasana is the hardest yoga pose. 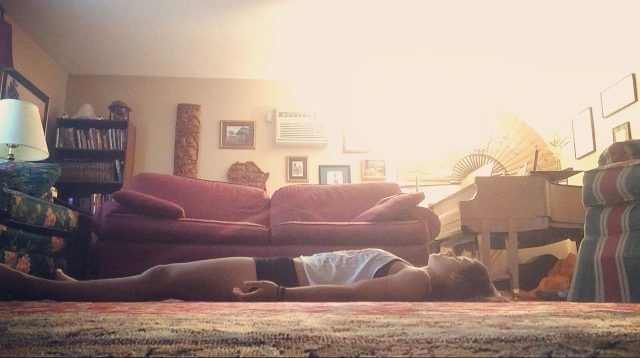 Savasana is the final pose in a yoga class (normally), where you lay silently for a few minutes. I used to dread this part of class. I didn’t want to sit still when I had so many other things to do. I got bored. My mind wouldn’t quiet. It seemed like a waste of time. But by being forced to lay in savasana week after week, something amazing happened. I actually started to enjoy it. I began to crave the stillness and quiet. Sure, my mind still never fully quieted, but I started to gain more control over it. Being still is a lost art. With constantly being connected through texting, email, Facebook, Snapchat, and all the other crazy apps out there, we’ve forgotten how to be still. Or, at least, I know I did. It wasn’t until I started to practice yoga (and was forced to be still), that I learned how to slow down. During my college years, I was consumed by my ever-growing to-do list, my pile of homework, and the next shift at one of my multiple jobs. Yoga has taught (and is teaching) me to be still off the mat, as well as on the mat. I no longer feel the need to book my schedule solid. I no longer dread a night at home by myself. I’ve learned that if can do crazy asanas, but can’t lay in stillness for 5 minutes, I’ve got a lot of work to do. The pose seems simple at first : lay on your back with your feet stretched out to the corners of your mat and your arms by your side with palms up. Close or soften your eyes. Start to relax your body: releasing tension in your toes, legs, stomach, fingers, arms, chest, shoulders. Soften your jaw and your forehead. Let your breath return to its natural rhythm. And then the hard part: work towards letting your mind quiet. Maybe you watch your breath, noticing your inhales and exhales. Maybe you repeat a certain phrase to yourself. Maybe you try watching your thoughts, not judging them or indulging them, but just letting them pass. Chose whatever feels more natural for you.